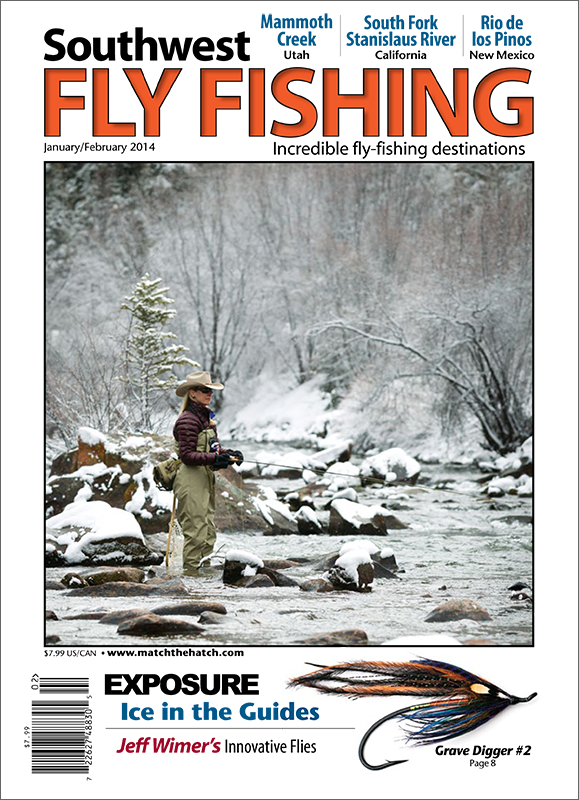 of Southwest Fly Fishing magazine. Cover photo by Michael Mauro. Don’t judge a book by its cover. The old adage may be somewhat threadbare, but it certainly holds true when applied to a nearly forgotten fishery in eastern Arizona. Outside the dense pine forest that is home to the White Mountains’ more famous regional waters sits an unassuming reservoir surrounded by 360 degrees of lunar landscape where, at the end of a dusty stone driveway, anglers find Becker Lake. Upon reaching Becker, you may not think it much out of the ordinary, but the 22-inch trophy rainbow trout thriving below the water’s surface make this place truly special. Becker, possibly the oldest man-made lake in Arizona, was formed circa 1880 by impounding water diverted for irrigation purposes from the Little Colorado River. When full, its total surface area covers approximately 100 acres and reaches a maximum depth of 22 feet, with a median depth of 10 feet. 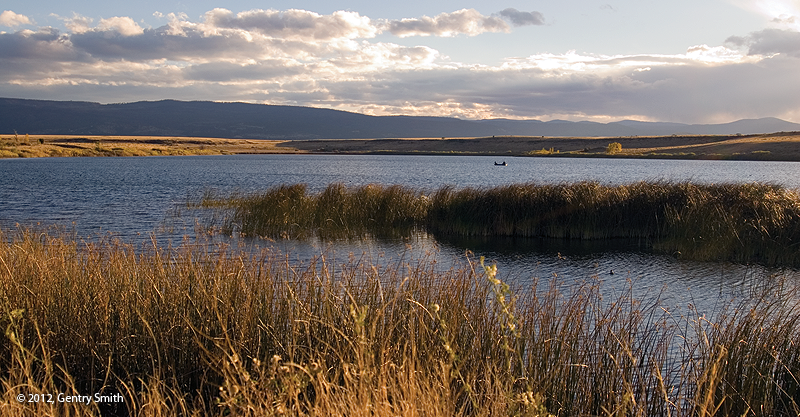 The reservoir’s site—just within Springerville’s western boundary on US Highway 60—is also home to the adjacent Becker Lake Wildlife Area, where wintering bald eagles perch atop the nearby cottonwoods. The lake, is well known for its waterfowl, shorebirds, and other wildlife. Becker’s minimal lakeside amenities include ample parking, a paved boat ramp, a permanent fishing dock, and vault-style restrooms. Overnight camping is not permitted at the lake. 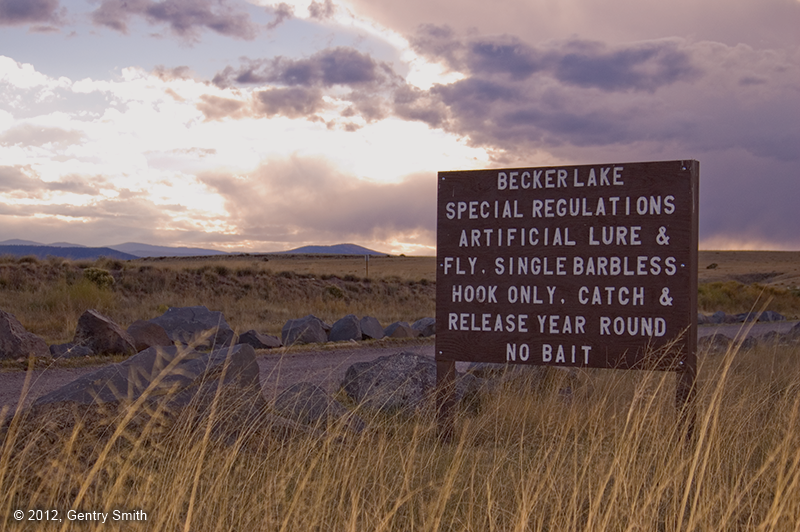 In 2011, as the result of an extensive survey conducted of area anglers, AZGFD elected to initiate catch-and release and year-round single barbless hook regulations on Becker Lake. 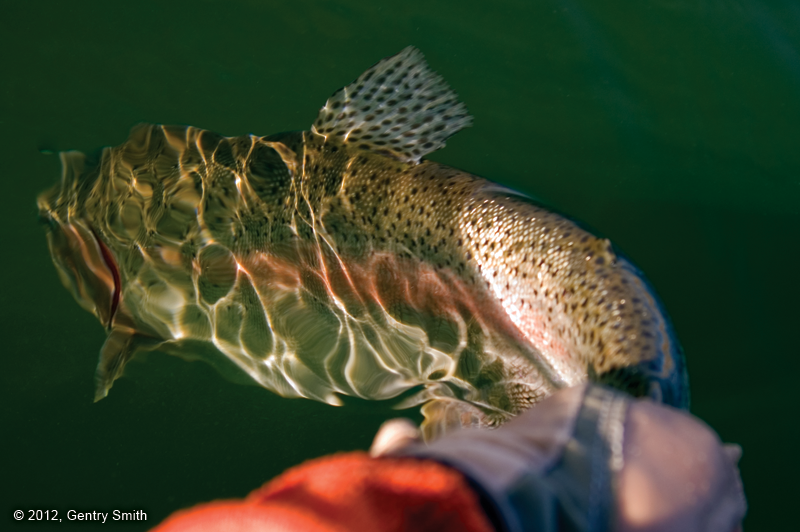 The new restrictions were part of an effort to address anglers’ increasing desire for more opportunities to land larger fish by fostering a genuine trophy-trout fishery. With the new rules in place, there was only one question remaining: who would monitor the lake to ensure that everyone was following these guidelines? Because of departmental constraints, the AZGFD lacked the resources to adequately police the lake. This situation is where the newly formed WMLF was able to step up to the plate. Its volunteer members raised donations in a grassroots effort to fund the infrastructure improvements necessary to install a full-time lake host, who now monitors the location for possible poaching and educates visitors on the proper handling of fish that are to be released. 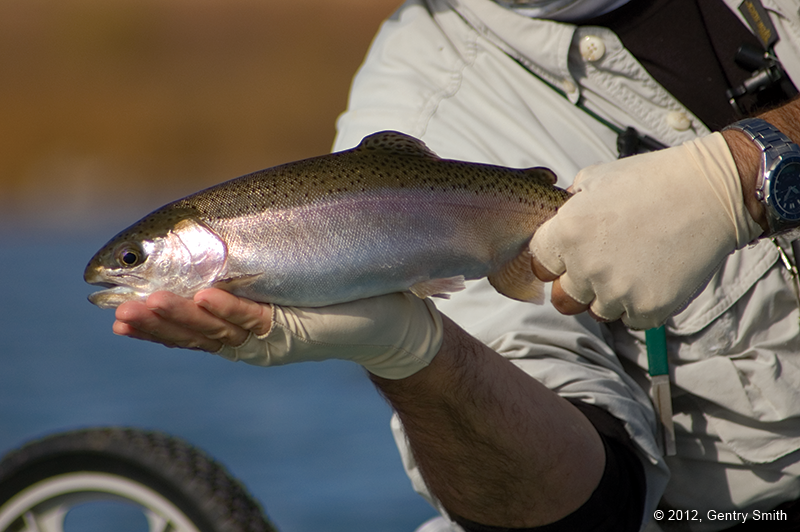 In addition to introducing the new catch-and-release regulations, the AZGFD began stocking Becker Lake annually with triploid trout, which are genetically sterile rainbows unable to reproduce in any environment. Lacking the ability to spawn, they invest their reserve energy in eating and, as a result, grow large quickly. The combination of new angling conditions and the sound enforcement of them—along with fast-growing trout—has resulted in an incredibly productive fishery in a very short amount of time. Being a weedy, shallow basin lake, already capable of producing the abundant food supply necessary to support a healthy trout population, Becker Lake became a perfect candidate for a trophy fishery. At first glance, this spot may not seem significantly different from any of the other White Mountains lakes. Many area waters have physical attributes similar to Becker and, therefore, also possess the potential to produce really big fish. However, while these other places may produce trophy-class fish for a year or two, they inevitably fall victim to the winterkills that routinely plague this area. As a result, the holdover trout become casualties of oxygen depletion below the frozen lake surfaces. Becker Lake sits at a slightly lower elevation than its neighbors (6,910-feet), which allows it to avoid these seasonal winterkills and remain fishable nearly year-round, with the exception of the coldest weeks of winter. Spring fishing typically starts to heat up at Becker Lake earlier than it does at its regional counterparts. As the water temperature begins to warm, midges begin to rise daily. During this part of the season, the trout seem to key in on midge hatches almost exclusively. Savvy Chironomid anglers incorporate slip indicators to strategically suspend midges up to 20 feet deep in order to target gluttonous trout that are gorging themselves on the tiny morsels. As summer approaches, mayflies, such as Callibaetis, make their first appearance on the lake. Shortly thereafter, damselflies arrive and remain throughout the warmer months. Simi Seal Leeches, tied in a variety of colors, are popular patterns with fly anglers who prefer to throw big streamers. The egg-sucking version of this fly can be particularly effective in the early months of the year. By late summer, the lake’s temperature begins to soar and creates stress on the fish population. 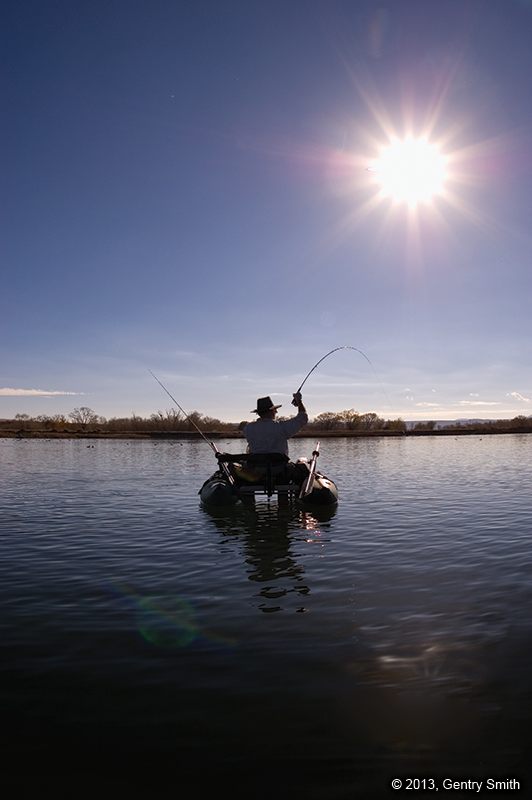 The AZGFD advises anglers to avoid “overplaying” the fish and, whenever possible, quick releasing them while they’re still in the water. If you must get a picture, try to minimize the time the fish is out of the water and be sure to completely revive a fish before releasing it. Knowledgeable anglers are aware that autumn can provide Becker’s best fishing experiences of the year because the lake’s trout are trying to bulk up for the impending winter months. At Becker Lake, peak fall fishing usually happens sometime around mid-November. During this time, the big boys swim about freely, looking for substantial meals such as leeches and the last of the season’s terrestrials. A local fly pattern called a Dog Bone—it’s simply a small piece of chamois cloth tied to a hook—has gained quite a reputation as an irresistible leech imitation at Becker. This unique fly can be successfully fished under an indicator or while being stripped in. Having some sort of watercraft will help you cover more territory on Becker Lake. 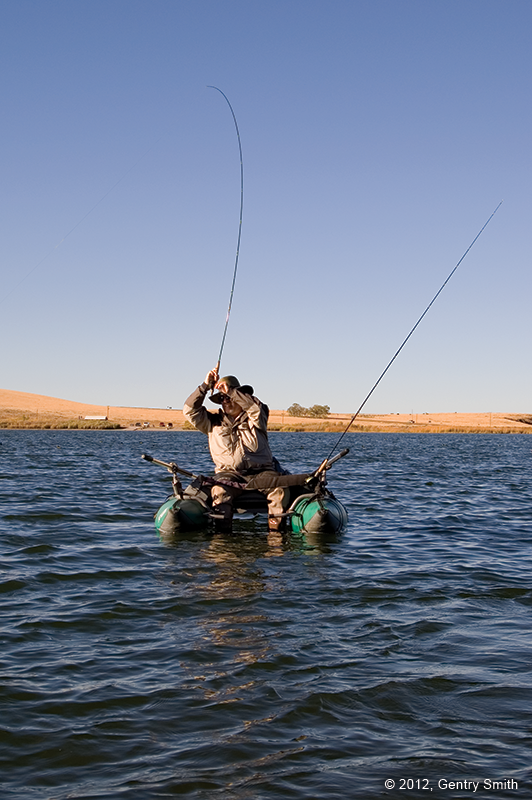 Motorized boats with up to 10 horsepower are permitted, and inflatable pontoon boats and float tubes also make excellent choices for fishing Becker Lake. While a boat will certainly open up more angling opportunities here, there is still a fair amount of water that can be effectively fished from the shore or by wading. Much of the lake’s upper end, located near the parking lot, is very shallow. Wading this particular section is especially good on days when the winds are extreme and the lake is covered in whitecaps large enough to make an inflatable watercraft impractical. Fly rods suitable for Becker Lake range from 4-weight to 6-weight. 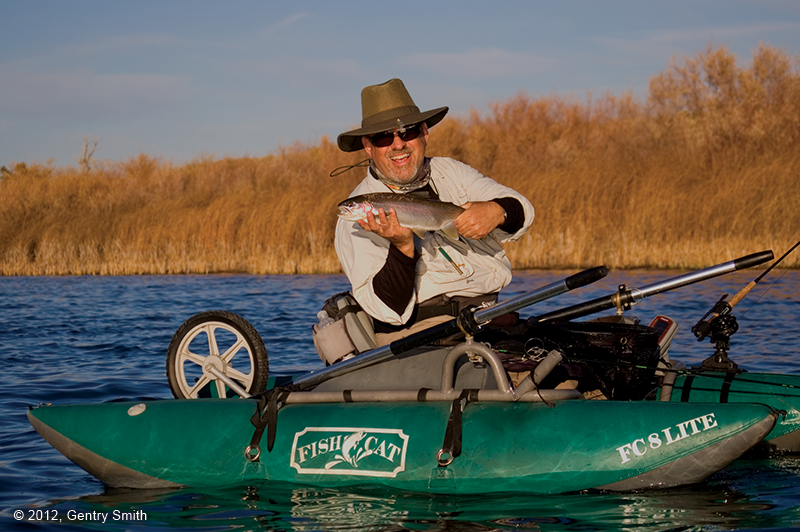 A two-rod setup—one rigged with a floating line and a second rigged with a sinking line (intermediate or type-2)—will prepare fly fishers for everything from fishing top-water bites to sounding the complete water column below. Lighter leaders generate more strikes but will consequently result in more break offs. Every angler who has fished Becker Lake can likely tell a tale about the one that got away. And it’s probably more than one: the lake’s large rainbows are known for snapping tippets on the hook set or coming unbuttoned as they make powerful runs for the weedy bottom. Anglers fishing deep or off-color water quickly learn that heavier tippets equate to more big fish brought successfully to hand. Downtown Springerville, located only minutes away, provides convenient lodging and services close to Becker Lake. When traveling to Springerville, stay on US Highway 60, which becomes Main Street as you enter town from either direction. Here, anglers traveling on a budget will find no shortage of economy options in the form of local motor lodges. Those looking for a more memorable experience should check into the Rode Inn Motel’s John Wayne Suite, which features a spacious, tastefully themed room honoring the famous actor, who once owned a nearby ranch. 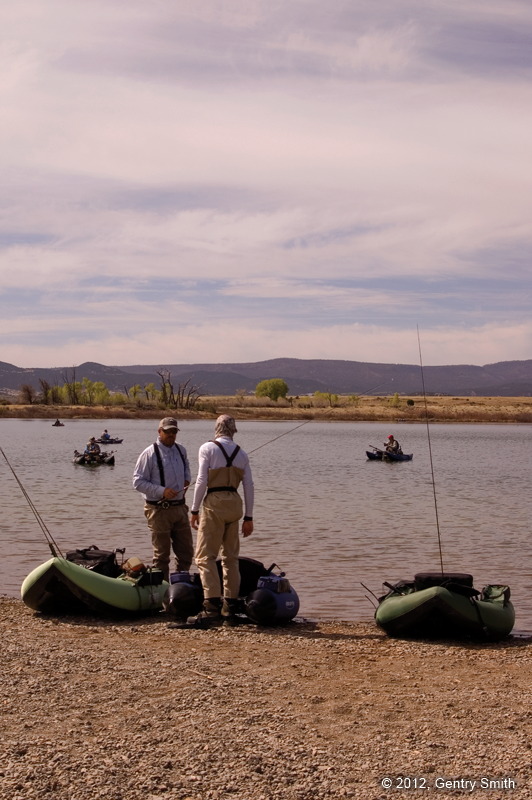 While Springerville is not a sprawling metropolis, anglers will find that it adequately provides all the basic necessities for them and their nonfishing companions. Hungry visitors will enjoy dining options ranging from fast food to full-service, dine-in restaurants. One notable eatery, Los Dos Molinos, (928) 333-4846, serves authentic New Mexican fare that is sure to impress “foodies” who like their dishes picante. Be sure to stop into Western United Drug & General Store on East Main Street to pick up anything you may have neglected to bring along. A part of the community for more than 76 years, it will probably have whatever you need… and then some. There are several additional lodging options located within an hour or so of Becker Lake, with the next closest town being Eagar. The largest city in the area, Show Low, is west of Becker Lake on US Highway 60. Nearby communities of Pinetop-Lakeside and Greer feature rustic charm galore in a more traditional wooded setting. At both these locations, visitors will find cabin rentals that range from quaint getaways for two to grand mountain retreats capable of hosting even the largest groups. The surrounding Apache-Sitgreaves National Forest is home to many dozens of lakes and small streams, and provides ample outdoor recreation activities, including seemingly unlimited camping options. And if that isn’t enough, there are more lakes and streams tucked away on the White Mountain Apache Tribe’s (WMAT) Fort Apache Indian Reservation. Special permits are required for fishing on tribal land. The nearest fly shops are in Pinetop-Lakeside. The Hon-Dah Ski and Outdoor Shop, located at 787 State Route 260, boasts a full-service fly shop.